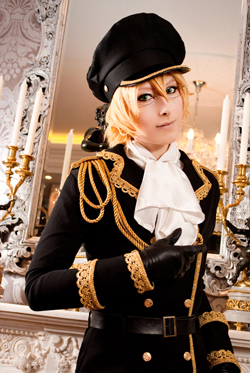 This technique's been used on a lot of my wigs now: Princess Tutu, Marlene and Ari (Okage: Shadow King), Lal Mirch (Katekyo Hitman REBORN! ), Madame Red (Kuroshitsuji), Chrome (Katekyo Hitman REBORN! 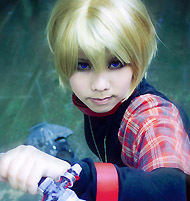 ), Gumi (VOCALOID), Sora (Kaleido Star), Chise (Saikano) and Keito (Star Driver). Most of all, I like the natural looking high and low lights it gives, and the ammount of control I have over the shades of colour in the dye. 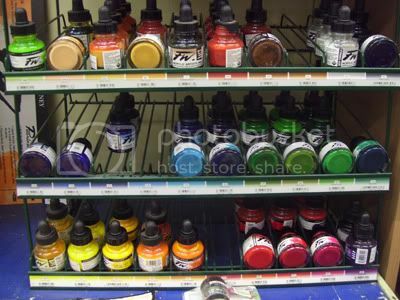 The ink that I always use is FW Acrylic ink, it's available locally at Eckersley's, or online at numerous craft stores. Ideally, you want to get all of your pigment for your dying from mixing various colours of the inks, however, on occasion I've been able to add a touch of acrylic paint, to help the colour along if I haven't had any ink in the right colour. Though I don't advise making your dye with a majority of paint. This is nearly everything you need for dying! 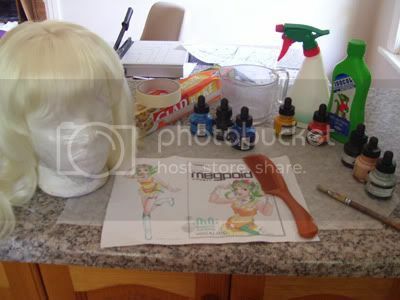 Your base wig, reference, wig comb, FW ink, rubbing alcohol, spray bottle, paint brush, masking tape, greaseproof paper and GLOVES. I also advise to do this outside on a sunny day, though you can also do it inside using a hair dryer. This is because the principle is that the rubbing alcohol evaporates leaving the dye in your wig, and the faster this happens, the better. So grab your ref, and start mixing up the inks. You're going to need quite a lot to get the pigmentation to show through on the wig once it's diluted with rubbing alcohol. Otherwise, it's going to come out a less vibrant colour and appear 'watered down'. 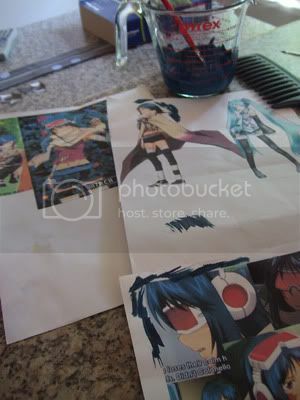 Once the ink is all mixed, you can squeeze the rubbing alcohol into it and mix it in. With the rubbing alcohol, half a bottle will do a short wig, but anything between shoulder or mid-back length, you'll need most, if not a whole bottle. Test our your spray bottle to see if it works, and then pour the ink/alcohol into it. You may need a funnel to help if you're as useless at pouring as I am. This is how I set myself up outside, use the masking tape to stick some of the greaseproof paper down and onto the ground. This is so you won't get dirt sticks and bugs in your wig, and so you don't end up with random splodges of colour every where too! Shake up the spray bottle (you'll want it on a fairly large, soft mist) and start dying your wig! 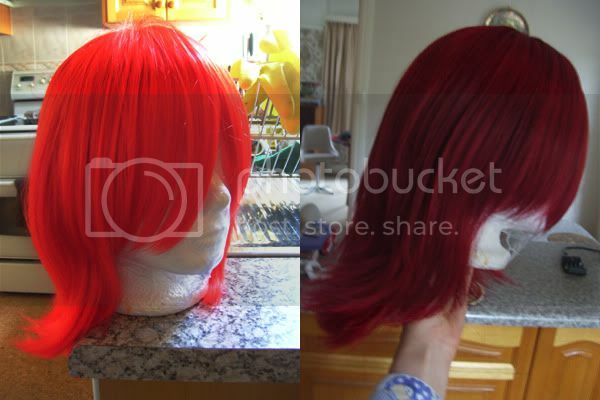 It's best to spray a few parts of the wig to see if the colour's coming out as the colour you want it to be. If it isn't, you'll have to add a bit more dye into the spray bottle and shake it up again. I normally work from the front to the back on one side, before doing the other side, just working my way through the wefts and spraying it onto one side, combing it through, and then doing the other side of the weft - if that makes sense? 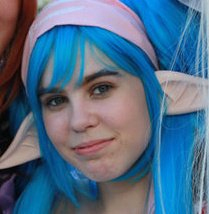 Particular trouble areas that are harder to dye are the fuzzier fibers around the face, as well as the top of the wig. Once you've done all the wefts close to the base of the wig, you can then start on the rest of the fibers and brushing the dye through them. 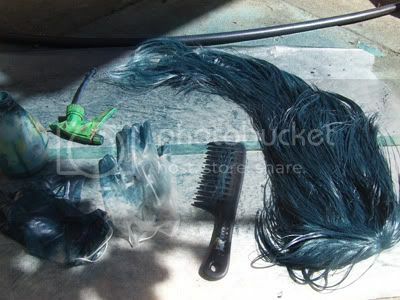 Once everythings covered, I'll usually leave the wig outside to dry in the sun. 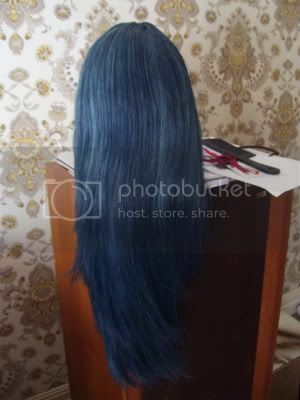 But you do have to keep going back to brush it whilst it dries, or else wefts of the wig will dry in clumps together. After the wig's dried, brush it out again. 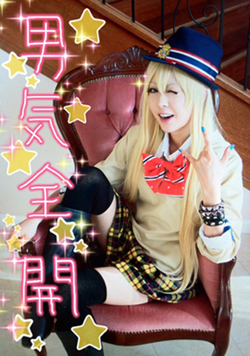 The fibers will feel quite starchy, but if you were brushing your wig during dying, this should be minimalised. And this is the lovely result! This shade of blue would've been impossible to find in most wig shops, so it was definitely worth doing a custom dye job. It's always best to dye white (or possibly light silver or blonde) wigs, though I have tinted them darker like my Madame Red wig, here. You can only ever dye wigs darker. It's impossible to lighten them.